“panel 12” is a big piece. It’s not named, I guess that it’s the bottom of the cupboard by it’s size and shape. Maybe NEXT have an aversion to printing the word ‘bottom’ or ‘base’ in their instructions? Maybe they think I don’t need to be told what this part is because it’s obvious? So now, all of a sudden, I’m not stupid but I may be a tad prudish. 3x rails. There are 3 drawers, these must be for the drawers. 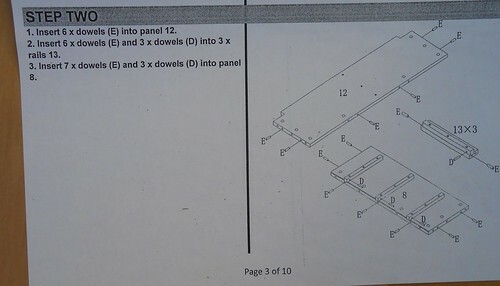 Panel 8 must be the divider between the shelves and the cupboard, yay, I’m working this out by numbers. Steps 1 and 2 need not be done in any specific order. If there was a 2nd person (tool) helping they could do step 2 at the same time as I do step 1. Both steps are part of putting the fixings on the main frame ready to slot it together – I’ll have to wait for step 10 before I get the fun of sliding the top on the bottom and sandwiching in the sides…. This scribble was published on Saturday, October 19th, 2013. You can follow any banter on this scribble with the RSS 2.0 feed. You can share your inspired musings after typing the anti spam word near the bottom of the page. But no Pinging because its too naughty.